I am happy to have guest author, Beth Trissel with us here today! And to top it off, today is the release of her book, Enemy of the King. I have had the pleasure of reading this novel, and it is FANTASTIC! Today Beth is going to tell us about the battle of King's Mountain. Enjoy! Years ago as I was researching my early American Scots-Irish forebears I often came across references to a battle fought during the Revolution called King’s Mountain. The name alone drew me. I vowed to go back later and research it more in depth and uncovered fascinating fodder for the imagination. 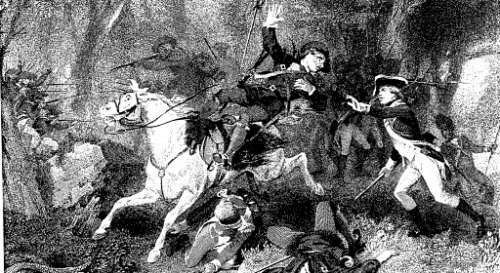 I learned about the gallant, ill-fated British Major Patrick Ferguson who lost his life and Loyalist army atop that Carolina Mountain called King’s back in the fall of 1780. Ferguson is buried there beneath a stone cairn, possibly along with his mistress who also fell that day. He had two, both called Virginia. But it’s believed one mistress made her escape on a horse by betraying his whereabouts to the advancing Patriots. Speaking of which, I discovered the hardy, sometimes downright mean Overmountain men of Scots heritage didn’t take kindly to Ferguson’s warning that they desist from rebellion or he’d bring fire and sword upon them and hang all their leaders––all these enemies of the King! ‘Book title,’ I said to self. And Enemy of the King sounds much cooler than The Patriot. So I began what came to be my version of that famous movie, though I started my novel before it even came out. I’ve invested years of research into the high drama and romance of the Revolution. I don’t regret a moment and am seeking like-minded persons to share in this passion with me. That has an unfortunate e-Harmony ring to it. But I digress, (often). Needless to say, the Battle of King’s Mountain, a mega conflict that altered the course of a nation, plays a prominent role in this fast-paced Historical Romance. And, being drawn to mysterious old homes and the notion that those who’ve gone before us are not always gone, I included a paranormal element. So, step into the elegant parlor of Pleasant Grove, an eighteenth century Georgian plantation built high on the bluff above the Santee River. Admire the elegant lines of this gracious brick home and its exquisite décor. Stroll out into the expansive garden between fragrant borders of lavender and rosemary. Bask beneath the moss-hung branches of an enormous live oak, then saunter back indoors to dress for a candlelight dinner in the sumptuous dining room. But don’t plan on a lengthy stay, you’re about to be snatched away for a wild ride into Carolina back country. Enemy of the King is coming to the Wild Rose Press May 8th. I’m a historical/light paranormal romance author with the Wild Rose Press. I have four releases out with more to follow. My fascination with Colonial America, particularly stirring tales of the frontier and the Shawnee Indians, is an early and abiding one. My English, Scot-Irish ancestors had interactions with this tribe, including family members taken captive. These accounts inspired my passion. Intrigued with all things Celtic, much of my writing features these early Scot-Irish forebears who settled in the Shenandoah Valley of Virginia and surrounding mountains, spreading into Tennessee and the Carolinas. I am a member of Romance Writers of America, Virginia Romance Writers, Celtic Heart Romance Writers, the Golden Network, For the Heart Romance Writers... Married to my high school sweetheart, I live on a farm in the heart of the Shenandoah Valley with children and multiple animals. The beauty of the valley and uniqueness of rural life has led me to write a collection of atmospheric personal essays compiled into a work of nonfiction. Virginia is my inspiration. Anyway, I love your writing style. Interesting info on your family history. As a historical lover, I'm thrilled for your continued writing success. The mansion sounds beautiful and I can almost smell the lavander. This sounds like a fantastic book and another to add to by TBB digital read pile. Fascinating stuff. Beth, you've really piqued my interest in this era of history. Thanks! I'm delighted with your enthusiasm both for the story and the time period. Great interview! Your background story regarding the setting of the novel really hooked me. I'm going to have to move "Enemy of the King" to the top of my wish list! Congratulations on your wonderful success. You deserve it. Fabulous interview, wonderful stories, great detail...man girl, you got it all..keep up the good work. Thanks so much for being here Beth! Fascinating article! Loving it here! Thanks for having me and doing such a superb job with this post. This book sounds awesome! Great post ladies! Hi Beth! I so love learning the history that comes along with the books! I have mostly learned from reading my historical romances! Sometimes I find something I didn't know of and look it up and can be taken so far that I spend too much time reading about it, but its fun to do! This I've never read in a romance before with the Battle Of King's Mountain. Putting this on my wishlist! Thanks for all the great info! Thanks Caffey. I'm so glad you enjoyed it. Very kewl, Beverly. Thanks for sharing that. Visiting the battlefield was a moving experience for me.